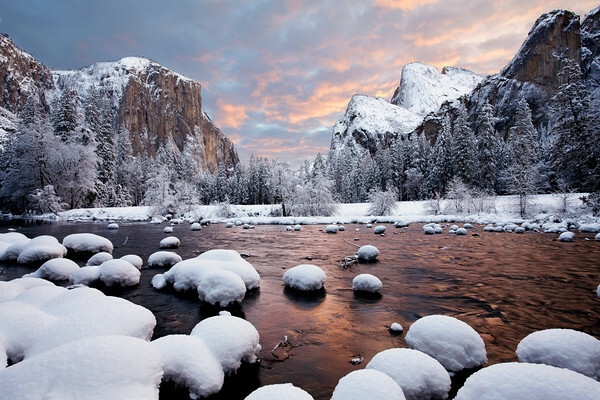 Four storms in less than a week passed over much of California which caused Yosemite to close. On Friday January 22, 2010 after the last storm left heavy snow between 12 to 18 inches on trees causing them to bend and break. All roads leading into the park were closed all day while I waited outside not completely aware of all of the damage. Later in the day a caravan of cars left the valley to El Portal and another was lead back into the park only allowing residence and employee's access. I was able to enter after 5:00 pm. This sunrise was worth the long wait from the prior day. Taken on 1.23.2010 at 7:08 am.